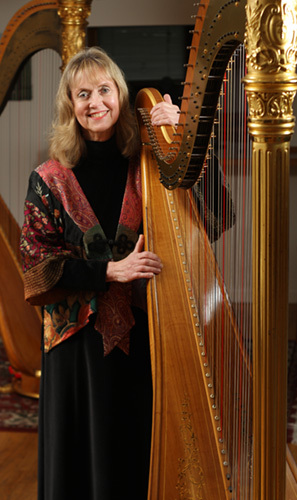 Harpist Susi Hussong :: Seattle :: Wedding, Event, Corporate, Funeral. Seattle Harpist Susi Hussong is available to perform at weddings, corporate events, special events, funerals, memorials as a musician and is also a teacher giving harp lessons. Our wedding ceremony music was exactly what I had envisioned and we just wanted to say thanks for making our wedding so perfect. You truly went above and beyond our expectations! Thank you for your help during President Bush's first official trip to Hawaii. The guests enjoyed listening to you. Your talents are greatly appreciated. Wedding, Special Event and Memorial Service Harpist. When you are planning your wedding, special event or memorial service I would enjoy helping you choose the perfect music and I would feel honored to play for your guests. Harp lends a very special ambience to many events. I also often play in duos, trios and other musical combinations with a flutist, violinist, cellist or vocalist and can take care of these arrangements for you. I mostly perform in Seattle, Bellevue, Kirkland and the surrounding areas of Tacoma, Bellingham, Everett and Olympia. I do book engagements and play beyond Western Washington. Travel expenses may vary. I teach privately, am the adjunct professor of harp at Seattle Pacific University and direct the Northwest Youth Harp Ensemble. I value my experiences as a teacher as much as I do performing. If you are looking for a harp teacher we could arrange a "get acquainted" lesson in my studio. Sharing my love of the harp with others is important to me. Please visit the rest of the website for more information and listen to samples of my playing. You may contact me either by phone at (206) 783-9493 or E-mail at harp4u@comcast.net.